When I stepped out of my car this evening, in the driveway, I could smell woodsmoke on the cool night air. I absolutely love this mix of smells and temperature that this time of year brings. I love it so much. It always transports me to another time and place, and subsequently, to a feeling: freedom. The other time and place is Tasmania, 2003. I was 20 years old. (That’s me in the printed photo in the above photo, in a CBLocals hoodie in the Botanical Gardens in Hobart.) I was travelling by myself at that point in my stay in Australia. It was May, but Down Under at that time of year it is Autumn. The air was cold and crisp, and carried the smell of wood smoke. I was staying in Hobart, and spending time exploring the city. Soon after I would travel North to a small community called Lorinna, and work as a WWOOFer on an organic farm. I was returning to Canada in a month but my time there in Hobart was all mine, to do whatever I pleased. I pleased to roam, and to smell the cold, crisp air. And I felt free, and it was brilliant. *** I’m doing a program with a life coach named Tiffany Han, these days. 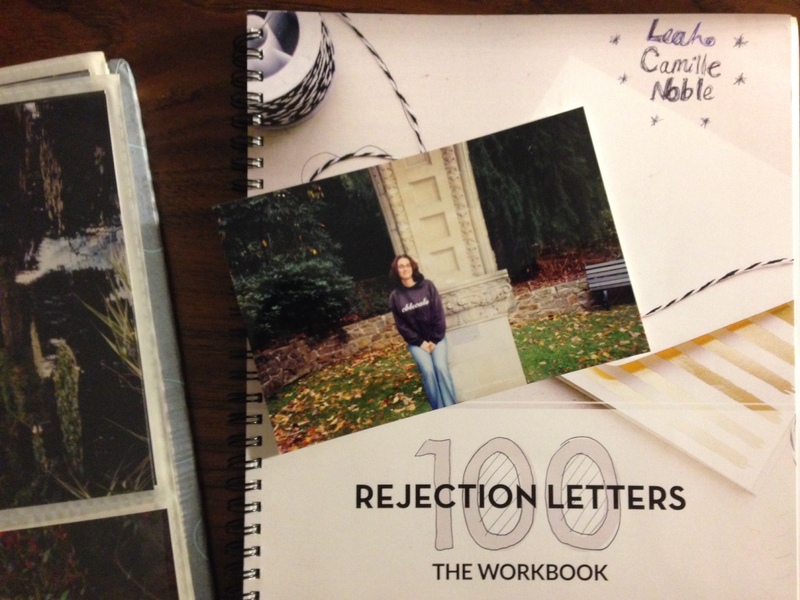 The program is called 100 Rejection Letters and I’ve been doing it for a month or so, give or take. 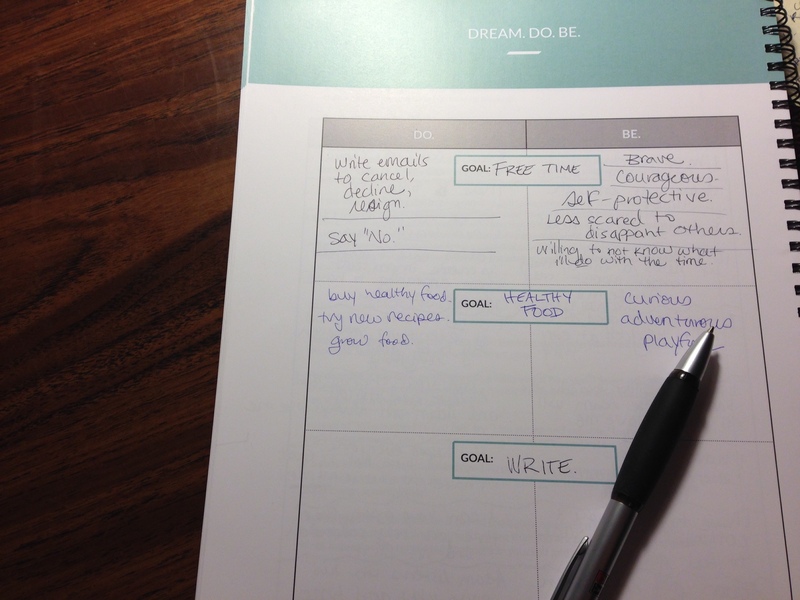 I’m getting ready to share with you what it’s been like so far in a post here on my blog (spoiler alert: it’s AWESOME), but for now I’ll just share a photo of a page in the workbook (above). The bottom goal of those three goals had been blank until today. Over the last month, I had been taking a few things off my calendar, knowing I wanted more free time, and knowing I wanted to create space for doing work that made me thrilled. The issue was, I didn’t know what that was, exactly. Or, rather, I’m doing this program in order to figure it out and move towards it. And it’s such a cool process, so I’ll definitely be telling you guys more about it soon. Anyway, today I got a call about an opportunity that makes me really excited, and if it does go ahead, I’ll for sure be telling you about it. What I can say for now, though, is that if it goes ahead, I’ll be doing a lot more writing! (Although I should say, it is NOT a book deal. Not yet anyway, LOL.) And after yesterday’s post, and thoughts, and subsequent comments, I’ve realized that the universe is saying to me: Leah, darling daughter, write. Write with your whole heart. Writing is what you have loved since you were small. It is what you still love. So keep doing it! This entry was posted in Leah's thoughts, Writing. Bookmark the permalink. So happy to hear this! You are a stunning writer and your posts never fail to fill me with a sense of possibility, of dreams and of what it means to chase joy. Thank you for blessing us all with your gifts! Yay! I love your writing. I am so happy you have come to this conclusion.